Description: this juvenile Tyrannosaurus has long slender legs, tiny teeth and a small head compared to adult Rexes. It does have the odd little two fingered arms seen on larger Rexes though. This figure stands in a neutral pose except for its tail, which is bent to the left somewhat. Its lower right leg hangs loose (though still attached) and can be twisted around, as if it’s broken or damaged in some way. The leg cast can be applied on the leg by sticking the pin on its inside in the little hole in the figure’s upper right leg. That way the twisted leg will “switch” back and the animal’s leg is healed; at least, that's the general idea. The Rex’s mouth can also be opened and closed. This animal comes with one piece of capture gear which can cover its head, like a muzzle. It’s coloured metallic dark brown, as is the leg cast. The Rex itself sports a light beige or pink colour, which can be found on the tail, flanks, head and limbs of the figure, and is brightest on the upper part of the legs and the front section of the tail (it's almost white there). On the underside of the creature (belly, underside of the tail, throat, lower jaw, lower parts of the arms and legs) the colour changes from a fairly bright hue of pink to a darker tone in a gradual way. The back of the figure is painted in a brown colouring, running all the way from the snout to the tip of the tail. Stripes and spots in the same dark colour can be found on the flanks, tail, legs and head. The Rexling has small white claws on its fingers, white teeth, a red tongue and cat like white eyes with black pupils. On its upper right leg (above the dino damage feature) it has a black JP logo. 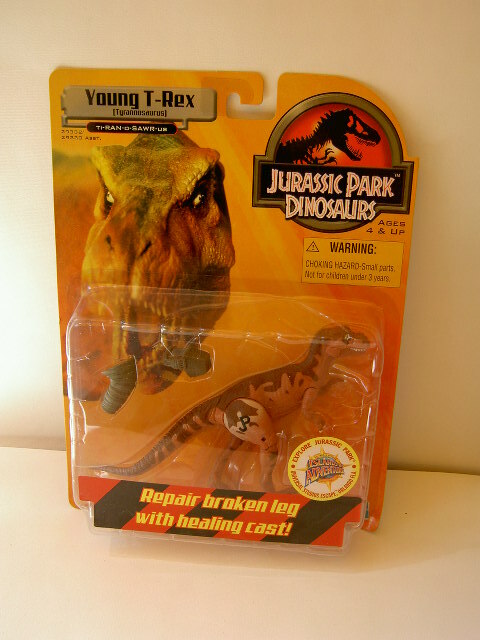 Analysis: since there are no really big T-Rex figures in this first JP: Dinosaurs line, this almost screen accurate baby T-Rex got repainted twice for it to fill the obligatory Tyrannosaurus vacancy. Unfortunately, one of these two Rexlings got a lousy paint job, and it happens to be this one. To be harsh but fair, it's just plain boring. It has little appeal, and the use of colour combinations (brown combined with a sort of reddish pink) is pretty ugly. What's worse, the paint scheme is almost identical to the one on the previous junior T-Rex figure, spots and stripes all in the same place (but on that figure, a more appealing paint job was applied), so it doesn't score in the originality department either. As has happened to a lot of JPD1 dinosaur figures, some details were left out, most notably the claws on its feet. Oddly enough, the claws on the fingers did get a different colour, simple white, but this looks just as silly as the big soulless white eyes this repaint got. It's a damn shame the paint job is so poorly done, since this is otherwise still a pretty decent figure. It looks very close in shape to the little T-Rex seen in the TLW movie, and such a likeness hasn't been seen all too often in JP dinosaur action figures. The leg action is a fun option, and also nigh on movie accurate, though it has its downsides (leg cast covers only half the leg and looks silly, leg often swivels back on its own accord, leg is somewhat fragile, etc.). Basically this is a good figure ruined by an ugly paint job. Fortunately the second Junior T-Rex repaint of this line fared better. Repaint: yes. This is a repaint of the TLWS1 Junior T-Rex, with repainted accessories from that same figure. The figure would be repainted again for JPD2, and would also be featured a second time in this first JP: Dinosaurs line in a dinosaur/human 2-pack. Overall rating: 5/10. It's still a good, largely movie accurate sculpt, but the colouring is very dull and uninspired, and the paint scheme is so similar to its predecessor that it also fails as an original paint job, since it just isn't. This is one of the more common JPD1 figures and it can still be found more easily than most of the other figures from the same line, not surprisingly often for lower prices.